One of the best things we are working on right now is a little project to put new shoes on the feet of some orphans. 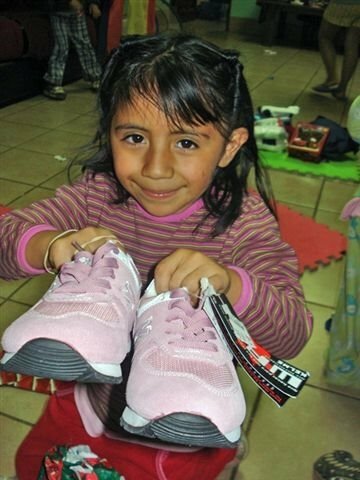 At Christmas, Maranatha Church gave new shoes (as well as lots of clothes and toys) to all of the kids at Casa Shalom Orphanage in San Lucas, Guatemala. Since, in most cases, this was their only pair of shoes, they are in desperate need of replacement. We put out an opportunity at our worship services on Sunday for anyone who wanted to buy a pair of shoes for a kid. In usual fashion, the great people at Maranatha stepped up and got excited about the project. This week – our friends go shoe shopping. This coming Sunday morning – we bring the new shoes to church with us. Sunday afternoon – we pack all of the shoes in suitcases. Next Monday morning – we fly out of Miami to Guatemala, shoes in tow. Next Tuesday – the kids of Casa Shalom get brand new shoes! All 60 of them! Next Wednesday, we hop a plane back home, hearts full. For a few months, Letha and I have been collecting new clothes for the kids. We plan to take these six suitcases of clothes when we go. In all, nine suitcases or about 450 pounds of clothes and shoes will go to the kids. By the way, Maranatha is also providing new underwear and socks for all of the kids. This may seem like a simple thing, and no big deal. But if you are a child living at the orphanage, it is a VERY BIG DEAL! Thanks everybody! I can’t wait to post the pictures upon my return.